What is it? – This is the Only Level is an ingeniously quirky platform game where you repeatedly guide a tiny blue elephant to the exit of a single level with constantly-changing gameplay. Who made it? – The game was created by Armor Games developer John Cooney (jmtb02). How does it play? – Things start simple enough. You’ll notice your elephant enter via a yellow pipe on the left, and he’ll need to make it to an identical pipe on the right. Spikes adorn certain parts of the walls and ceilings. There’s a big red button on one of the platforms, and some basic jumping is required to reach the exit. 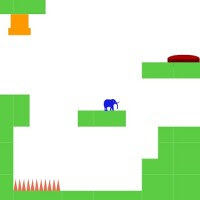 Presentation – If you’ve played Achievement Unlocked, you’ll immediately notice that everything from the little blue elephant, to look and feel of the level, are all identical. It’s not a sequel though, but really a different game altogether, though told within the same context. In short, the graphics and sound are minimalist, but highly effective. The music, by Kevin MacLeod is also excellent. Positives – No games come to mind that make you puzzle-solve in quite the same way, which is what makes This is the Only Level so good. Knowing your (unchanging) objective, but having to figure out a bunch of different way to complete it proves to be an compelling (and often humorous) gameplay concept. Negatives – If you’re not familiar with platform game conventions, some of the references may seem sort of esoteric. It also probably could have been a bit more difficult, but it still gets its point across and was enjoyable throughout, nonetheless. Why you should play it – There’s an element of genius to This is the Only Level that most gamers should appreciate. Most impressively, it remains interesting from beginning to end. Despite the limited terrain, the scope of the gameplay makes it a title you need to play.